Current dominant thinking and practice in both the private and public sectors continually assert that people’s development needs are in conflict with, or mutually exclusive to, the need to conserve the biosphere on which we depend. As a consequence, we are asked to either diminish development in the name of conservation or diminish conservation in the name of development. Efforts to identify complementary objectives or mutually acceptable trade-offs and compromises described in this publication indicate, however, that this paradox does not always need to exist. State of the Apes: Extractive Industries and Ape Conservation, the first in a biennial series, draws attention to the evolving context within which great ape and gibbon habitats increasingly interface with extractive industries. Commissioned by the Arcus Founda­tion, the State of the Apes’ objective is to raise awareness about the status of apes around the world and the ways in which they and their habitats are impacted by human activities. Apes are closely related to humans and are vulnerable to many threats posed by humans to their habitat and their survival. To increase understanding of both the severity and extent of those threats, as well as the possibilities and potential for their avoidance and mitigation, this publication brings together leading scholars and practitioners from various sectors, including conservation, industry, and academia. The aim of this Arcus Foundation initiative is to create a biennial series of publications that influence debate, practice, and policy by seeking to reconcile ape conservation and welfare with economic and social development through objective and rigorous analysis of relevant issues. Robust statistics on the status and welfare of apes will be derived from the Ape Populations, Environments, and Surveys (A.P.E.S.) Portal (apesportal.eva.mpg.de). This first publication presents a narrative of research, analysis, case studies, and best practice from a range of key stakeholders relating to the interface between ape/biodiversity conservation and extractive industries. The publication incorporates related factors such as governance, corporate social responsibility, land tenure, social development, and international trade and trends. 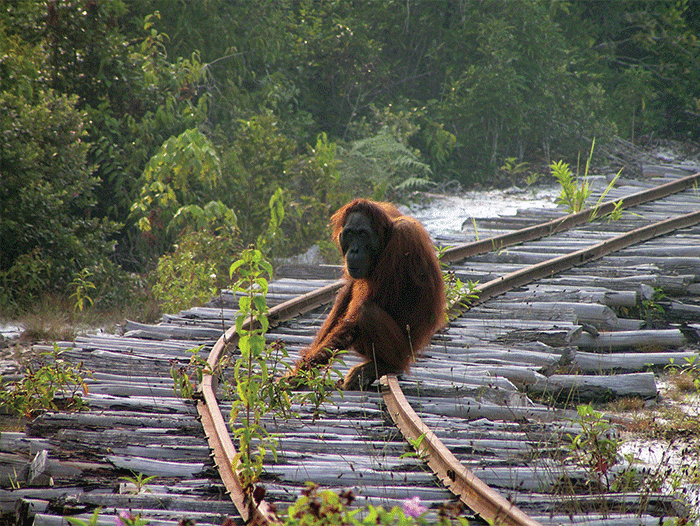 Through objective presentation, the contents of this publication can contribute to improvements in conservation practice and inform and influence communities that include commerce (logging, mining, oil and gas), law (legislative protections, industry regulation), and human development by showing how these groups interrelate and affect the current and future status and welfare of apes and the people who are dependent on their habitats. An aim of the series is to introduce ape conservation into local, national, regional, and international policy dialogs, as well as into development and economic planning. The focus of the publication is on all nonhuman ape species, including chimpanzees, gorillas, bonobos, orangutans, and gibbons, within the contexts of their range countries, which encompass much of the tropical belt of Africa and South­east Asia. Contributions—commissioned to represent a range of expertise that includes conservation organizations and individuals, industry, academics, and social and environmental justice organizations—are collated to present a holistic overview of current thinking and practice in this arena.